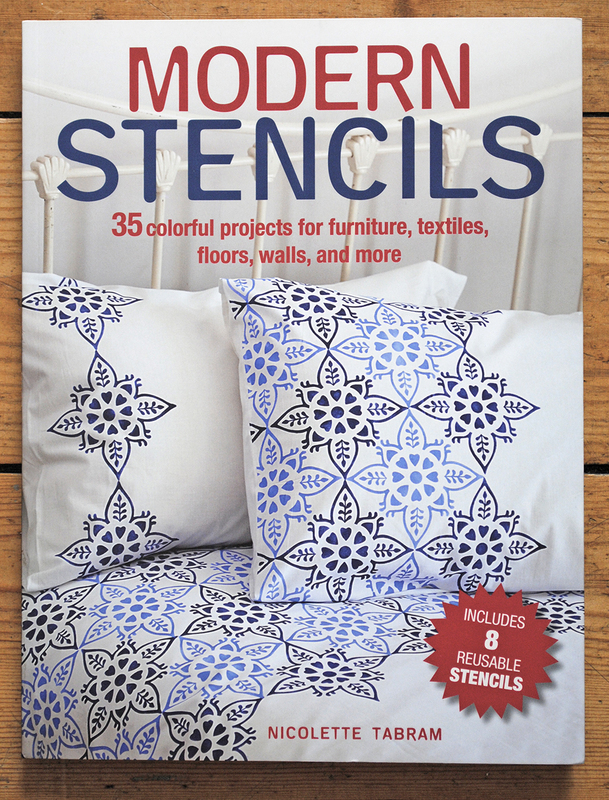 On March 13th my first book called Modern Stencils will be published by Cico Books. Here is the story of how it came about. In September 2016 I took a stand at the Handmade fair and to my amazement within the first couple of hours on day one, I was approached by the publisher of Cico Books who asked if I would be interested in writing a book about stencils. One of my main motivations for taking the stand at the fair had been the hope that a publisher might see the potential in a new book about stencilling. We exchanged contact details and after a few weeks I dialled the number for the direct line to the publisher. The world of publishing is seasonal, obvious really, but I hadn’t had reason to consider it before and as the timing wasn’t right, we agreed to speak again in month. There is a fine line between being proactive and pestering and on my fourth call a few months later I held my breath and thought this is the last time I can do this without becoming a nuisance. Yes they were still interested and would be in touch. I put the phone down and decided not to call again, but to wait in the hope that when the time was right, they would contact me. Four months later on the May bank holiday weekend, and after a long lunch with friends, I came home to an email from the publisher and suddenly it was all stations go. They needed to shoot the first batch of projects a few weeks later. I had just taken on a huge freelance project! Working to a tight deadline, I developed 35 new projects covering furniture, fabric, floors, homes and gifts. Each project required a new stencil design and so no summer holiday for me. After cancelling several social arrangements and a weekend away, I acknowledged that my social life was going to have to be put completely on hold and so I cancelled everything. Last summer was very, very busy! By the end of September I had finished writing the words and my contribution was complete. It was out of my hands and left to the editors, designers and productions staff to create the actual book. One of the big challenges was for the production department to source the material for the 8 pre-cut stencils which are in the back of the book. The material had to be in the correct weight, too lightweight and the stencils would be flimsy, too heavy and they would be too thick to fit into the back of the book. Last week a box was delivered containing several copies of the book. I knew it had arrived, but I was out celebrating a friend’s birthday. Arriving home in the early hours to a sleeping household, I sat on my sofa and with a flutter in my stomach, I opened the box. Previous A Simple ‘How To’ Video Using the Bergen Border Stencil. all your amazing ideas together in one book is a dream come true!